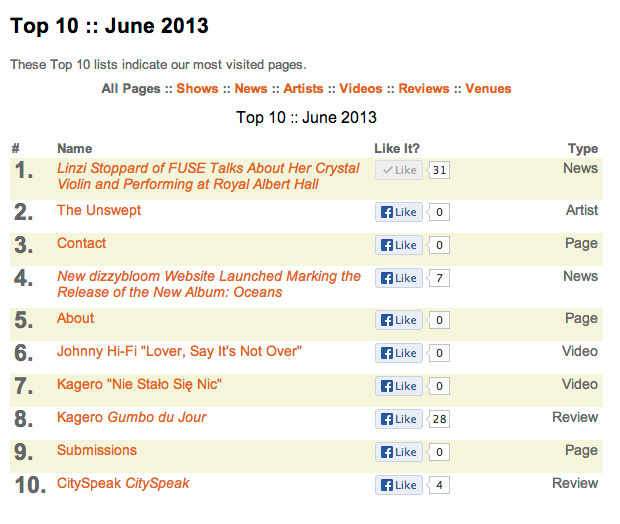 Linzi Stoppard, her crystal violin, and her dynamic duo FUSE take Coyote Music's #1 most-viewed title in June 2013! We had the pleasure of interviewing Linzi, and her tales of performing at Royal Albert Hall and hijinx at the Glastonbury Festival made for an enjoyable read. At #2, Chicago's The Unswept stays in our Top 10 for the third straight week. Less scintillating, though good for business, our Contact information page was #3. Coyote Music was particularly excited for June's #4: the press release announcing the launch of dizzybloom's new website, created by Coyote Music's Owner, Wiley Koepp. dizzybloom formed in Austin in the late 90's and regrouped a few years ago. Their website launches along with the release of their third album, Oceans. Our own "About" page climbed to #5. Thanks for reading about us! New L.A. transplants, Johnny Hi-Fi released their latest video, which made its way to #6. If you haven't seen it yet, check out "Lover, Say It's Not Over." At #7 and #8 in June were New York City's Kagero—the video for "Nie Stało Się Nic" and our review of their album Gumbo du Jour. Our promotion for Kagero's June 8 show at The Bitter End resulted in several spikes in traffic to our site, particularly from NYC, Poland, and Japan. Apparently that happens when you promote a "Japanese Gypsy Rock" band covering a popular Polish song. Who knew? 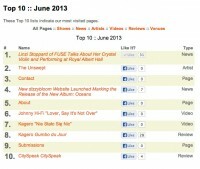 Our own Submissions page snuck in at the #9 spot and our review of Cityspeak's self-titled effort rounded out June's Top 10. Thanks as always for watching, listening to, and reading about the bands promoted on Coyote Music!